The Flatdata version 1.56D is the primary means for performing data conversion from CSV data to MS-ACCESS database. The Flatdata engine has a comprehensive set of features to allow you to export, monitor and process the CSV data. The Flatdata software has a complex data filtering to prevent the illegal and invalid CSV data to be processed or exported into MS Access database accidentally. It will quaratine any illegal and invalid CSV files found during the data processing. Additionally, the Flatdata engine provides CSV data backup after exporting the data into the database. - Intel Pentium processor; Pentium 3 or higher processor. - Windows XP or higher operating systems. - 512 MB of RAM or higher. - .NET Framework 2 or higher version to be installed at your computer. - Minimun 500MB of harddisk space. - VGA or higher resolution monitor. Super VGA recommended. 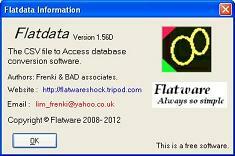 The Flatdata 1.56D is a free software.